‘Naach Basanti Naach’ the famous line from the all time super hit movie ‘Sholay’ echoes as one reaches Ramanagaram, just wondering where Gabbar-ka-adda was. Who would have ever imagined Sholay that was shot in Ramanagaram would be such a big hit and that the movie would rock even after 3 decades, I guess such is the might of Ramanagaram Rocks. 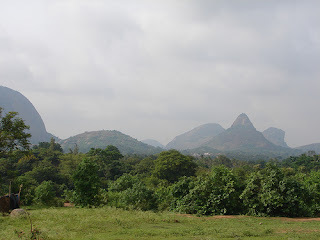 Ramanagaram is passionately called the ‘Rock Climbers Mecca’, at 1000+ MSL it is spread over 4-5 kms in radius encompassing 7 major hills, many hillocks and large boulders. A week-end or a holiday would mean that you get to see the Rock Climbers of Bangalore doing what they do the best, climbing those magnificent rock faces and enjoying the aura of the place. 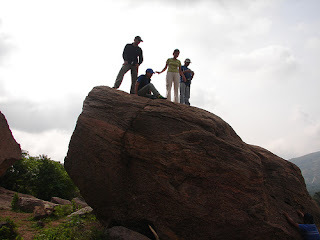 The boulders of all kinds and shapes en-route give enough challenges to a learner and an experienced climber, making the trek up to the hill more and more exciting. The texture of the rock can rip off the skin in case you are not careful enough, but what the heck there is nothing bad in having few bruises here and there when you want to do some good bouldering. 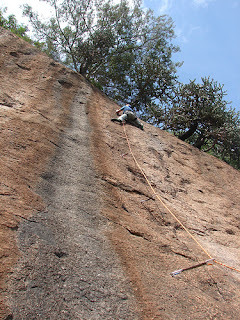 As you explore the landscape you will find few good rappelling faces, you could just fix ropes and start rappelling or could use the bolted routes to go up the rock face and then rappel down. The rock face near the pond on the hill have some 8+ bolted routed and if you are confident enough, know the basics of rock climbing and have climbing gear & equipments i.e harness, carabineers, belay device, ropes, quick draws, climbing shoes and a good partner to belay, you could do some real rock climbing all day long. What ever the case may be any activity in adventure sports has to be a calculated risk and it’s important to take the calculated risk more seriously. The rocks are always there to climb only if return safe. Every place has a history so does Ramanagaram rather a vibrant one also not to miss silky present, it’s the largest cocoon marketing center. 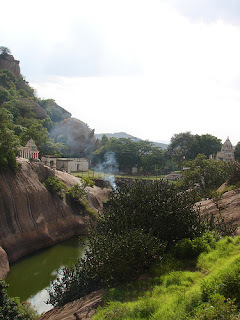 The name Ramanagaram was officially christened in 1949, originates from the village Ramagiri on the foot hill of Ramadevarabetta (hill of lord Ram). Ramanagaram is around 50 Kms from Bangalore on the Bangalore–Mysore highway and is the taluk center for Bangalore Rural district. Situated on the banks of the river Arkavati, mention of Ramanagaram is recorded as early as 268 AD during the rule of Mauryas to Gangas, Cholas, Chalukyas, Hoysalas, Vijayanagar rulers, Kempagowda, Mysore kings, Hyder Ali, Tipu Sultan and the British. As a traveler who would like to just visit or as adventure sport enthusiast wanting to scale the rock faces, Ramanagaram simply ‘Rocks’. All you need to do is have a Rocking time and keep the place litter free.